Darren McGregor says he is thrilled to have agreed a two-year deal to join Hibernian – the club he has always supported. The Edinburgh-born defender previously experienced spells with both Cowdenbeath and St Mirren and he was named Player of the Year at Rangers last season. The 30-year-old parted company with Rangers on Monday and says the lure of playing for Hibernian was irresistible. Speaking exclusively to hibernianfc.co.uk, McGregor said: “I’m absolutely delighted to sign for Hibs – it’s a dream come true for me to play for the club. “I’ve supported Hibs my whole life, so to now get the opportunity to sign for the club is brilliant. Head Coach Alan Stubbs says he is delighted to be able to add the experienced centre-half to the squad. Stubbs said: “We’re delighted to be able to welcome Darren into the group – his arrival provides real competition for places. “He has always played well against us and he is strong, experienced player and a good professional. "We're always looking to strengthen the squad and the arrival of Darren will do exactly that. McGregor has been handed the number 24 shirt and hopefully the club’s latest signing will be available to feature in Wednesday night’s Scottish League Cup second round tie against Stranraer at Easter Road (kick off 7.45pm). The future is exciting, so why not fully become part of it by embracing the Hibs Share Issue? Our home, our past, our future. 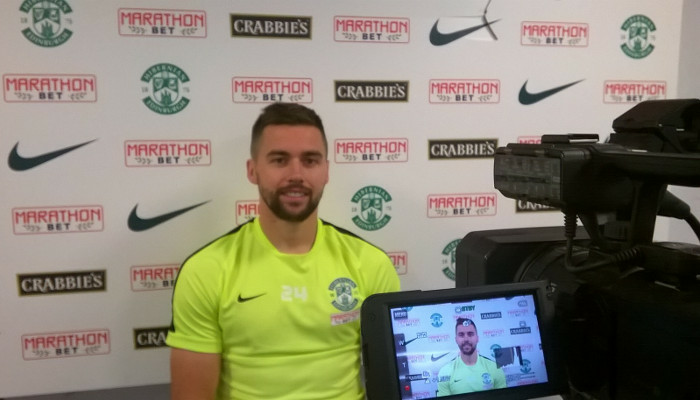 The full interview with new signing Darren McGregor will be available to watch later on Hibs TV.